Anyone who thought that introducing baseball to the Olympic Games was like giving the USA a licence to produce gold medals was well wide of the mark. Baseball has a long Olympic history as a demonstration sport, featuring at the 1912, 1936, 1956, 1964, 1984 and 1988 Games. The 1952 Helsinki Games even had a demonstration of pesäpallo - Finnish baseball. But it was not until Barcelona in 1992 that baseball made its debut as a full medal sport, and since then it has been dominated not by the USA, but by Cuba. The Cubans won three of the four baseball gold medals up for grabs between 1992 and 2004, with the USA's only success coming in Sydney in 2000. Indeed, after being beaten 2-1 by Mexico in the quarter-finals of the American qualifying competition, the USA did not even make it to Athens for the 2004 Games. That was a real surprise, given that baseball's roots can be traced to the United States in the early 19th century. Although it was clearly based on British sports like rounders and cricket that were popular in the 17th and 18th centuries, baseball's first formal professional organisation was the National Association of Professional Base Ball Players, formed in the USA in 1871. It was replaced five years later by the National League of Professional Baseball Clubs. But perhaps Cuba's Olympic success should not be too much of a surprise. After all, Cuba's first professional league was not far behind. It was formed in 1878, only two years after the National League in the USA, and in 1999, Cuba's national team crushed Major League side the Baltimore Orioles 12-6 in an exhibition game. Baseball spread to other Latin American countries too, including the Dominican Republic, Nicaragua, Venezuela and Puerto Rico. It also won over Japan, Taiwan and Australia, and many Latin Americans and Asians have played in the American Major Leagues. In fact, baseball's all-time home-run champion is Japanese. Sadaharu Oh hit 868 during his career in Japan. 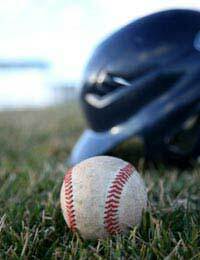 The objective in baseball is to score the most runs in nine innings, with teams taking turns to bat and field. Each team bats until three of its batters or runners are out. If the score is tied after nine innings, extra innings are played until one team wins. At the eight-team Olympic tournament, each team plays the other seven and the best four advance to the semi-finals. The semi-final winners meet to decide the gold and silver medals, while the two losing semi-finalists compete for bronze. Baseball has been dropped from the programme for the 2012 Olympics in London, as has the similar sport of softball. While the baseball tournament is open only to men, the softball tournament is open only to women and follows the same format. Unlike baseball, softball has been dominated by the USA. The United States won gold when softball made its Olympic debut in 1996 and retained the title in 2000 and 2004. A softball is as hard as a baseball but is bigger, being 12 inches in circumference compared to nine inches. One pitch at Atlanta was clocked at 118 kilometres per hour, which means softball batters have the same time to react as their baseball counterparts. Baseball pitchers throw at up to 160 kilometres per hour, but stand 60 feet from the batters, whereas softball pitchers stand only 43 feet away.